After centuries of being shrouded in taboo and superstition, periods have gone mainstream. Seemingly overnight, a new, high-profile movement has emerged—one dedicated to bold activism, creative product innovation, and smart policy advocacy—to address the centrality of menstruation in relation to core issues of gender equality and equity. 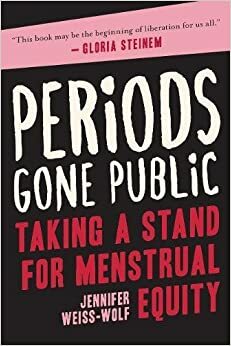 In Periods Gone Public, Jennifer Weiss-Wolf—the woman Bustle dubbed one of the nation’s “badass menstrual activists”—explores why periods have become a prominent political cause. From eliminating the tampon tax, to enacting new laws ensuring access to affordable, safe products, menstruation is no longer something to whisper about. Weiss-Wolf shares her firsthand account in the fight for “period equity” and introduces readers to the leaders, pioneers, and everyday people who are making change happen. From societal attitudes of periods throughout history—in the United States and around the world—to grassroots activism and product innovation, Weiss-Wolf challenges readers to face stigma head-on and elevate an agenda that recognizes both the power—and the absolute normalcy—of menstruation. The first step toward action is acknowledging that menstruation matters and is a viable political issue. Changing our law will improve the lives of many who are marginalized – the incarcerated and homeless – it’ll improve the lives of low-income people who struggle to afford these products, and it’ll improve the lives of all women when our bodies are treated as normal. This entry was posted in Activism, Women and Economics, Women's Health. Bookmark the permalink.